Francesco Molinari’s raw talent and determination have helped to make him a successful golfer on both the PGA and European Tours. Born in Turin, Italy in November 1982, Molinari is the younger brother of European Tour golfer Edoardo Molinari. During his amateur career the younger Molinari enjoyed a series of wins, including the Italian Amateur Stroke Play Championship on two occasions. After earning his European Tour card in 2005 through qualifying school, he finished in 86th place on the campaign's Order of Merit in his rookie season. Molinari claimed his first victory in May 2006 when he became the first Italian, since Massimo Mannelli in 1980, to win the Telecom Italia Open which brought him to 38th place on the Order of Merit. Between 2007 and 2009, Molinari recorded 20 top-ten finishes, including three second place positions. The Italian once again found the top of the leaderboard when he teamed up with his big brother to lead Italy to their first World Cup victory at the Omega Mission Hills World Cup in November 2009. The talented brothers teamed up once again during the 2010 Ryder Cup at Celtic Manor, helping Team Europe to beat the United States 14 ½ to 13 ½. The then-29-year-old’s impressive year also included beating Lee Westwood by one-stroke to win the WGC-HSBC Champions, moving him up to a career-high number 14 in the world rankings. In 2012 Molinari won the Open de Espana, on the first anniversary of the death of Spanish golf legend Seve Ballesteros. The Italian golfer sailed to the top of the leaderboard following a bogey-free seven-under-par score of 65 on the final day to come up from behind. Following the tournament, Molinari said: "Everything went according to the plan perfectly ... [The anniversary] just makes it even more special ... It's always special to win on tour, but to win in Spain in these circumstances is even better." Later that year he was once again selected for the Ryder Cup Team. Halving his final match with Tiger Woods to give Team Europe the edge against the United States. While it would be another four years until his next victory, Molinari continued to be a consistent player on both the PGA and European Tours. A decade after his first win, Molinari won the Italian Open for the second time in 2016, becoming the first Italian to win the tournament more than once. 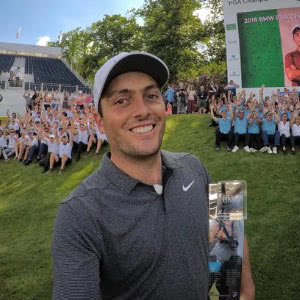 In May 2018 Molinari claimed his fifth European Tour victory and first Rolex Series title after winning the BMW PGA Championship at Wentworth, two-strokes ahead of Rory McIlroy. A few weeks later Molinari claimed his first PGA Tour title at the Quicken Loans National. Finishing with an impressive 21-under 259 total to break the tournament record by an incredible seven-strokes.